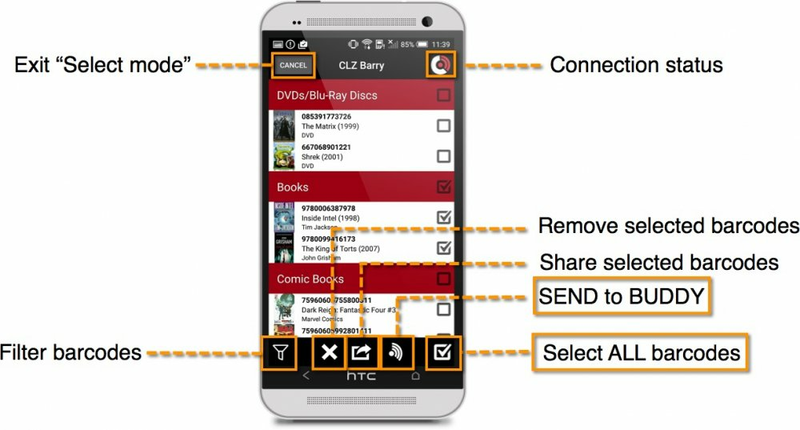 Batch mode lets you scan multiple barcodes with CLZ Barry while it’s offline. E.g. to scan an entire shelf of DVDs or books. Then later, when you are at your computer, you can send the entire list of barcodes Add Screen. Make sure Barry and Buddy are NOT connected, you can do this by tapping the connection icon in CLZ Barry, or disconnect Buddy. Open the Collectorz software on your PC or Mac. Click the Barry icon, click Connect and close the Barry Settings screen. Check the boxes for the barcodes you wish to send. Or you can tap on “Select All Barcodes”. Now hit the “Send to Buddy” icon (2nd from the right). All barcodes will now be sent to your Search Queue, one by one.